Lisa from Talk Functions shares how she planned a carefree day for Debby and Rob. Debby & Rob wanted nothing over the top. They wanted something simple where their guests including themselves could feel relaxed and just enjoy the day. 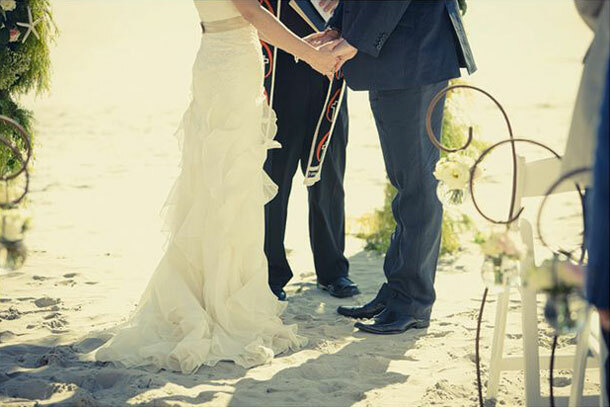 They chose Strandkombuis in Yzerfontein as their Wedding Venue with its casual beach atmosphere and rustic and untouched landscape. The venue is hugged by dunes, fynbos, salt pans & the famous 16 mile beach. You can hear the cries of seagulls flying over hoping for an invitation to join you for dinner, the smell of the ocean and the sound of the crashing waves on your doorstep. You literally cannot get any closer to nature than this! The Ceremony was held on the beach and the Reception was held in the open air Seafood Restaurant where the guests feasted on a selection of local seafood. When designing the décor elements the word “Casual Elegance” came to mind. We combined rustic and classic elements. The basic rustic wooden structure of the venue started transforming as we started decorating and injecting some colour in with the use of flowers. When we switched on the chandeliers and fairy lights and lit the candles it became truly magical. Never underestimate the power of light or should I say the importance! You might have the most beautiful décor but without the right lighting it will fall flat. It was a day filled with an amazing sunset, heartwarming speeches, laughter, dancing and to end the evening the Fire Performers put on a spectacular show on the dunes under the stars ever so bright. Sybrand Cilliers captured every moment with such care & talent.